It can be yours to play around with, but we don’t want you to hurt yourself, you'll have to show that you know what you are doing. See if you can slay enough enemies to acquire this magnificent piece of history. So four new Side Jobs are available for those who want a ballistic history lesson and prove their worth. ...is the friend next to you. The one who has your back as the bullets start flying. So join the RAID community group. We also have some in-game items for both RAID and PAYDAY 2 as you join the group. The ones that’ll make sure that the reich will fall. Time to join the RAID gang. If you own PAYDAY 2, you get a 10% loyalty discount! Being able to stitch together your treads was key if you didn’t want to bare your arse during a raid. Nowadays we focus a bit more on style and that’s why you are now able to design your own Armor in our brand new Armor Workshop. Maybe good ol’ Union Jack on your ballistic vest? Protective helmets were of the utmost importance during the War, and the way they did it back in the 40s is still top notch quality. All PAYDAY 2 Steam Group Members can now honor our fallen grunts by using these WW2 Masks in PAYDAY 2. They knew how to design a uniform back in the days. Simple and effective design that struck fear in those seeing it. Let’s go a bit retro with the armor shall we? A WWII themed Armor Skins Safe is now yours to pry open. Your weapon is one of your closest friends during combat. But as you pile them up in the barracks during lunch, it can be hard to find yours again. So paintjobs might help. A WW2 themed Weapon Skins Safe is now available. This item popped up at an auction in North France during the 1990s. Among the auction goers sat a woman in her 50s. She recognized it and even though she could not remember the name of the officer who wore it, she paid a hefty sum for it. As a young girl she visited a square to buy vegetables when paratroopers came dropping down. Gunfire, explosions and screams of fear and pain filled the air. The officer took her to a shelter in a government building. He had no reason but kindness to save her. But even as his life was on stake, he risked it to save hers. She was just a young girl, but still recognized the hat. A pilot in the Royal Air Force went down during WW2 a few miles outside Białystok, Poland. Considered K.I.A, he was later found deep in the Białowieża Forest where he’d survived on fish, roots and animals he managed to caught - alive and well but madness had sunk his teeth into him. He’d been forced to amputate his left leg. But still managed to survive without infections. A small hut was also found, together with salvaged parts from his aircraft. He was found in 1978. In the small village of Pomtsburg, you can find a small monument. Few read the plaque covered with moss, but it holds the tale of a young boy. As the Germans came marching into Pomtsburg he lead the resistance with bravery and determination. Pomtsburg was his birthplace and no one were to destroy it. The Battle of Pomtsburg never reached the history books, and few even remember how it ended. But the boy managed to steal this souvenir. Something to remind him and others that you shall always stand up to oppression. This pilotka was found on a corpse near Lake Müritz in Germany. It was attached with a string around the poor, dead soldier’s head. There were no other bodies next to unnamed fellow, and as the origin of the pilotka was russian, it’s fair to assume that he stemmed from the same country. Speculations were many, none were true, but the most inspiring story was the one about a soldier so proud of the motherland that he tied his pilotka to his head before he died. 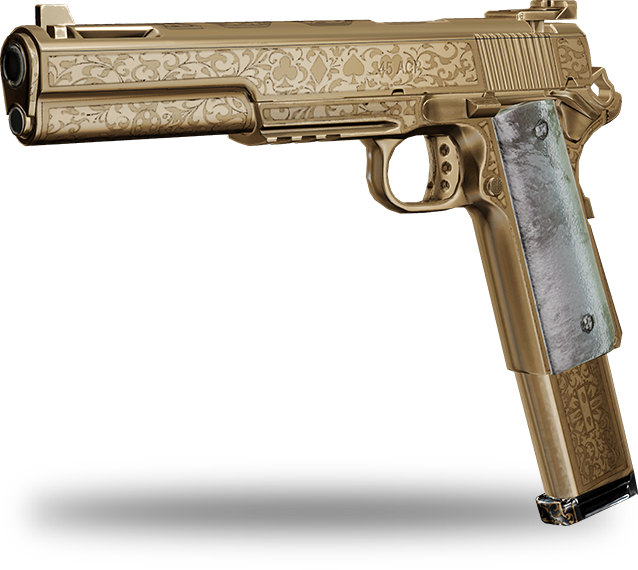 This pistol decorated with gold and mother-of-pearl may never have seen an actual front line. It was not carried by some lowly private but rather a decorated general with more paper cuts than battle wounds as he schemed over maps and surveillance photos. Handed from father to son in a lineage of pressed uniforms and polished brass, until it finally found its proper purpose; bringing chaos and carnage. It was found in a collection of treasures and other spoils of war. This pistol finally saw some real action, not in the hands of war heroes at the brink of history but criminals who can truly appreciate the beauty of a well crafted firearm. Information is key, and as you are working under the radar, you need as much as possible to be able to do your job. On Saturday 2nd September we are holding a AMA on Twitch with RAID: World War II producer Ilija from Lion Game Lion and Almir from Starbreeze Studios. Tune in your sets at 2pm CET. It would be lovely to think Sterling earned the beret and badge through hard-training and combat. The truth, however, is that he saw how it impressed a couple of young fillies at the Officers Club. An invitation to step outside, a few dirty punches and a knocked out Colonel later, and Sterling had his very own red beret. And a couple of fillies. Smashing! Kurgan doesn't wear the gas-mask to keep the fumes of war out. He wears it to keep the flames of fury in. Betrayed by his own side, Kurgan barely survived an ambush by armored flamers. Inside the mask, there is only the smell of his own immolated flesh - a constant reminder to trust no-one. Rivet is American, and Americans value tradition. From the office of the President, to the lowliest scum-sucker in the land, tradition matters. So if you’re going to stick a gun in a chump’s face and demand they “hand it over” you better damn well know your history. Like Jesse James, like Billy The Kid, you wear a bandana. This cap may look like a normal, standard-issue M43 field cap. And you may think such humble headgear is an unusual choice for a man as vain as Wolfgang. But this cap holds special meaning for him. It may surprise you that Wolfgang can truly love. Pinned inside is a picture of his beloved. For whom he fights the good fight.